I downloaded a bunch of Raymond Chandler novels...pretty much all of his Philip Marlowe books...well the first seven were written by him, but the eighth was finished posthumously...and since I'm ever-so-slightly OCD, I figured I'd remedy a small problem. You see, Marlowe book eight was finished by Robert B. Parker. And all but that one were re-issued by Vintage press in the late eighties. So all but that one had a unified scheme for the cover art. Well, that made me slightly neurotic, so I created a new cover that stayed in line with the previous scheme but still acknowledged all the responsible parties. 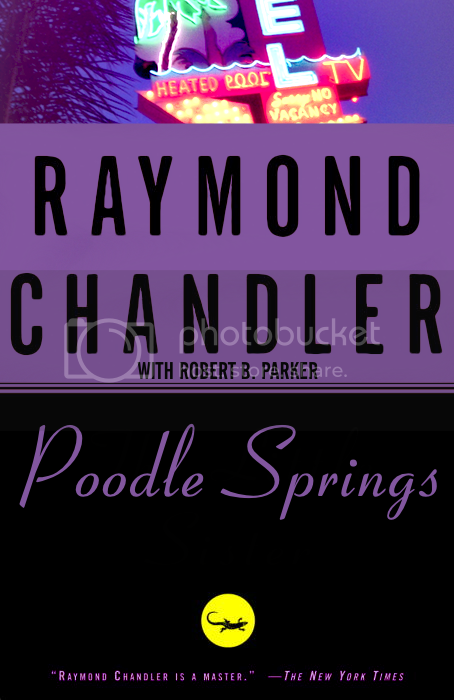 So, if you have an e-copy of the Raymond Chandler books that have cover art that looks like this, I'm happy to offer you matching cover art for "Poodle Springs" by Raymond Chandler and Robert B. Parker. You can find it here. I'm releasing it under a Creative Commons Non-Commercial/Derivative/Share Alike license. Please respect it...I reworked the cover art in the spirit of fair use, and I release it freely, provided you release any modifications under a similar license. I'm requesting no money for this derivative work...any modifications must be under similar restrictions. That's all I've got. Enjoy, all!